Since moving 3 years ago to the Vernon Village apartment complex, where half of Vernon’s residents live, Emilia Bernal says she has yet to attend a council meeting, vote in an election or speak with a city official. Her reason: She doesn’t feel a part of the industrial city. Bernal has a long list of concerns and wishes the city would make it easier for residents like her to get involved by holding meetings at the apartment complex, preferably in the late afternoon or on the weekend when people are more likely to be home. With just 200 residents it should be easy to do, Bernal said Monday, explaining it’s hard to get to council meetings held at 9 a.m. on a weekday. “You would think it would be less expensive than sending flyers,” agrees 32-year-old Edith Alarcon, who said she only hears from council members at election time. The Vernon Village residents’ comments come as city officials looks for ways to engage residents in a city where there are nearly 20 times as many businesses and warehouses as there are households. For years, Vernon officials welcomed their anonymity, preferring to do their work out of the public eye, behind closed doors at City Hall. With just 100 actual residents, it wasn’t hard to do. But the city says times have changed; the number of residents has doubled and Vernon’s new crop of leaders is working to involve residents through special events and other forms of outreach. On Monday, there were signs the invisible wall that once divided City Hall and the rest of the community could be coming down, as public works employees walked across the street to Vernon Elementary where they made a science presentation to students. 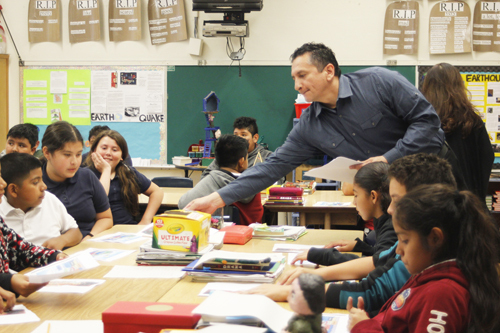 City staff visiting classrooms is becoming a regular thing, boasted City Manager Carlos Fandino. Principal Diane Espino told EGP these types of interactions, which have included visits from firefighters and police officers, help create a partnership between the city and the people it serves. 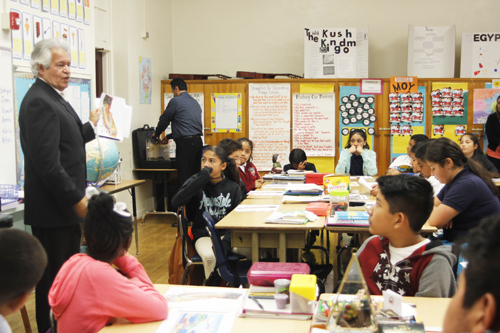 “Most parents work in the city and these children are part of the city’s daytime population,” said Espino, who hopes businesses in the city will be inspired to also invest in the small school. “Our community is so small, it’s important not just for the city to come out but for our neighboring businesses to get to know who we are,” she said. In the meantime, residents of Vernon Village, located on the city border, a stone’s throw from Maywood, say they feel isolated from what’s going on across the city at Vernon City Hall. “It would help if the city hosted holiday events or activities for our children, just so we start to get to know who they are,” she suggested. Ybarra understands and says the city plans to host three different events this summer at the housing complex. Councilwoman Leticia Lopez assures the council is listening, as are the members of the various city commissions that advocate for residents, which they can join. She notes that residents can always write a letter or email councilmembers if they cannot make it to a meeting. Vernon’s new council members and department heads truly care about the community, and that’s why the city has hired an in-house public information officer to help improve city outreach, according to Fandino, who added, “It takes time” to get it all done. There are 86 registered voters in the city, and last month, it took a mere 23 voters to derail a proposed utility user tax, crimping the industrial city’s plan for shoring up its budget shortfall. Fourteen people voted in favor. It was a disappointing outcome, considering city staff had descended on Vernon Village to register more voters, but only succeeded in adding 10 people to voter rolls. “If we know what’s going on in the city and they know what’s going on here, it would make us want to vote,” suggests Sianez. Fandino sees a silver lining: the utility tax failing is proof democracy works in a city that many once believed had too few residents to properly govern itself. Vernon is adding new tools to make the city more accessible, including a new social media presence and an emergency opt-in communication alert system to be rolled out later this month. Vernon Village property manager and resident, Merna Tovar, says she has witnessed city officials attempt to reach out to residents without great results, but told EGP she thinks that will change as city sponsored events and meetings become more regular and residents begin to feel more like neighbors. May 18, 2017 Copyright © 2012 Eastern Group Publications, Inc.